Does your baby’s health and happiness come before anything else? Do you want to give your child the best of the best, especially when it comes to their nutrition? We can say with absolute certainty that you answered yes to almost all of the questions above. Well, you are in luck because in this blog post, we will help you ensure just that – the health and happiness of the little love of your life. To guarantee those things, you need to pay special attention to their nutrition, something that plays a crucial role in their wellbeing. And for that, you need the best baby food maker by your side. As your child grows older and enters an age in which milk cannot fulfil all their growing needs, you need to add a lot more to their diet. This includes many things, such as steamed veggies, pureed fruits, blended meat items and so much more. The best food maker allows you to make fresh food for your baby with utmost ease ensuring that your kiddo remains happy, as do you! But before we go into the details of which of the top baby food makers you should buy, let’s first look at some of the reasons why having one in your kitchen is a must. When it is dinner time and you need to prepare your baby’s food, you want a machine ready and waiting for you to get started. So don’t ask yourself, “Can I use a regular food processor for baby food?” Using other food processors that you already own will often lead to clashes and a hungry, unhappy baby. Because of the specific cooking options that most modern-day food makers provide, as well as settings that are perfect for your needs, your food comes out perfect every time. No uncooked meat or burnt veggies either as a timer usually helps you keep in control of the situation at hand. Because of their specialised cooking processes, food makers ensure that the ingredients do not lose any of their vitamins or any other form of nutritional value that is essential for a growing child. That in itself is reason enough to invest in such a machine. All parents are multi-taskers and they know the pain of having to dedicate their attention to a single activity, such as cooking, at any given time when 10 other things need to be done. The easy-to-use food makers that require you to input the instructions before they take over the cooking process completely allow you to multitask without the fear of burning something. Food makers that are made specifically for little children put their safety and health first. This means that they are free from BPA, lead, and any other dangerous chemicals or materials that are not good for your baby – and that is not something you can take a risk with. You can find freshly cooked and nutritious meals for your baby at the supermarket but you can make cheap baby food at home and save money. In addition to that, home-cooked food contains no artificial sweetener or preservatives, which is a massive plus. By now you must be convinced that you need a baby food maker in your life. Well, we have the best picks for you. Read on and learn all about them! 10 Top-Rated Best Baby Food Makers of 2019. Babymoov Duo Meal Station Baby Food Maker 6.4 8 x 10 x 14 11 steam, blend, warm bottles, sterilize, reheat, defrost. QOOC Mini Baby Food Maker 4.25 10.3 x 9.3 x 7.8 - Steam, blend, reheat, defrost. 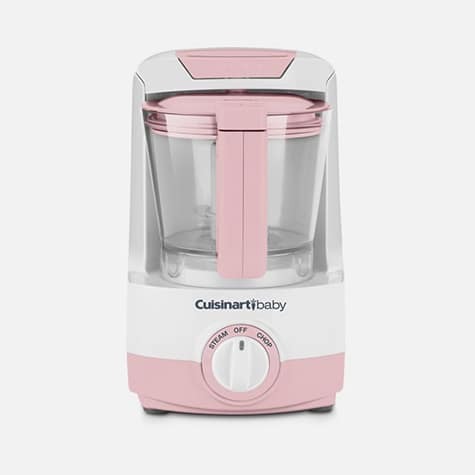 Cuisinart BFM-1000 Baby Food Maker 10 10.6 x 6.7 x 12.8 4 Steam, chop/puree, warm bottles. Hamilton Beach Bebe Baby Food Maker 6.44 8.8 x 11.8 x 13.1 5 Steam, chop, shred, slice, and puree. Philips AVENT SCF870/21 Baby Food Steamer and Blender 5.73 6.5 x 6.5 x 12.1 2 to 3 Steam and blend. Baby Brezza Glass Food Maker 8.25 9.8 x 7.5 x 9 4 Steam and blend. 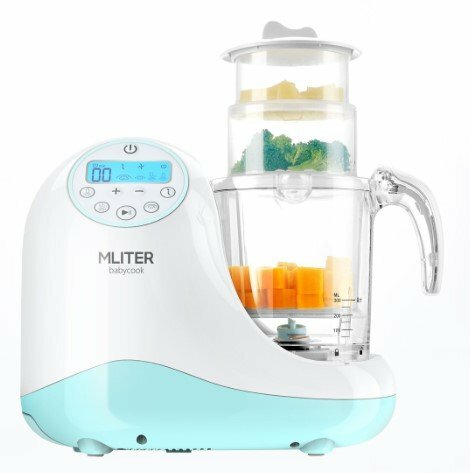 MLITER All-in-One Baby Food Maker and Steamer 4.96 12.6 x 6.5 x 9.05 4 Steam, blend, warm, defrost, and sterilise. 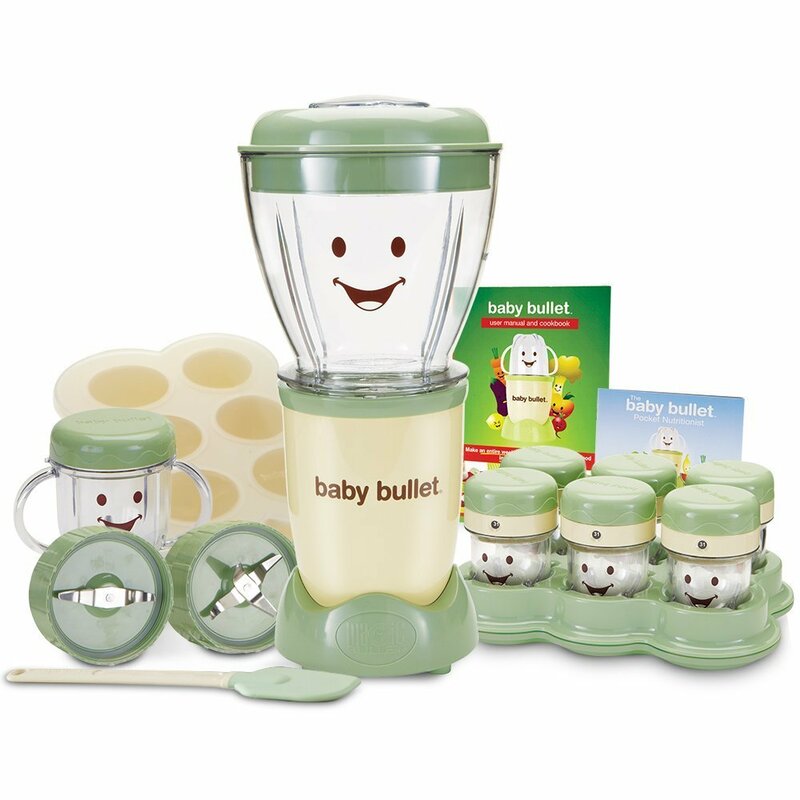 Magic Bullet Baby Bullet Baby Care System 5.75 12 x 10.6 x 9 8 Chop, mix, blend, whip, and grind. QOOC 4-in-1 Baby Food Maker Pro 4.85 11.1 x 10.3 x 8.9 - Chop, blend, steam, and defrost. Now that you have gone through the specifications, it is time for you to take a more detailed look into each of the products. For your convenience, after we have discussed the features of each food maker, we will also share with you the pros and cons, including the experiences of parents who have used the device, so that you have the complete picture in front of you to make an informed decision. This is a countertop appliance that can take care of all your needs when it comes to preparing food for your child. It steam-cooks, blends, and reheats – it really is an all-in-one food processor. Prepare, meat, fish, fruits, and veggies in whatever way you like with utmost ease. The average cooking time for this device is 15 minutes, meaning you have to spend less time in the kitchen and can spend more time with the little love of your life. You must often refrigerate or freeze the leftovers of the food you make for your baby. With Babycook, you can defrost and reheat them in a jiffy. You can cook up to 4.7 cups of food in a large bowl that has markings to make sure your measurements are on point every single time. This can amount to up to 18 servings of food at a time. Steam-cooking ensures that the food does not lose vitamins or any nutritional value at all, making sure your baby remain healthy and happy. A multi-purpose mixing blade makes sure you get the right texture every single time. The machine has a built-in timer with an audible alert that notifies you when the meal is done. While all of this seems to be a very complicated procedure where countless things have to be managed and taken care of, the food maker offers a simple, one-handed operation for your ease. An auto shut-off system adds to the convenience you are offered. This is a compact device that does not take up too much space on your countertop or in your cabinet. You can remove the cord when it is time to put the machine away, allowing for easy storage. It comes with a spatula, mixing lid/smoothie filter, and a recipe book so you can create new dishes every day and keep your baby excited for meal time. The device sports a stainless steel water reservoir. It is free from BPA, lead, and Phthalate. 4-in-1 functionality for your ease. Timer with an audible alert. Option to cook soups, purees, and other delights for the rest of the family. Customers sometimes complain of mould in the water tank that cannot be cleaned easily. Average blade – not too sharp, hence blending isn’t always smooth. While this product offers a multi-functional solution to all your baby food needs at a good price and is convenient to use, you need to be mindful of the fact that users in the past have complained of mould in the tank that cannot be cleaned. If you can figure out a way to do that, great, otherwise, you may want to choose another product. This food maker offers 6 easy-to-use functions that make cooking a breeze. These include steam, blend, warm bottles, sterilise, reheat, and defrost. So whether you are cooking from scratch, reheating a frozen meal, making a fruit puree or warming a bottle, you are covered from all angles. There are 10 programmable settings which give you a lot of freedom in the kitchen when preparing your little loved one’s meals. This food maker comes with not one but two steaming baskets so that you can make two different meals at one time. It can also steam and blend simultaneously. Three blending speeds allow you to have full control over the cooking process. An LCD display with one button for each function offers easy functionality. You have to fill the base with water before you start cooking. If you water dries up and you need more, you will be notified through the LCD screen. The food maker comes apart and the components that come into direct contact with the food are dishwasher-safe so you don’t have to spend an hour cleaning the machine later. The device may look small but you can prepare up to 11 cups of food at one time. This equates to around 25 portions which you can refrigerate or freeze for later use. The steaming option ensures that all the vitamins and nutrients are locked inside the food. You can set a timer when cooking a particular meal. When it’s done, an alarm will go off to inform you that it is done. 6-in-1 functionality so you are covered from all angles. Multiple operations at one time. LCD control panel and automated processes for ease-of-use. Make up to 11 cups of food at a time! Parents sometimes have complaints about the blender not being functional or as effective as they would have liked it to be. This product offers you some of the best features and multi-purpose functionality that promises ease-of-use and convenience. Although there are sometimes complaints from parents about the machine wearing down after a certain number of uses, others are in love with the product and the convenience it has to offer. This countertop device offers you four functions in the same machine, namely steam, blend, reheat, and defrost. So you can prepare all kinds of food, whether a puree, steamed veggies or any other goody for your baby without any trouble at all. Using the special instructions provided by the manufacturer, you can ensure that the food loses none of its nutritional value. It has an easy-to-use design and one-hand operation, keeping in mind the fact that parents are multitaskers and are likely doing more than one thing at any given time. A quiet motor ensures that you do not end up with a headache once you’re done cooking. The product features a premium precision prep blade that lets you chop or puree anything under the sun – this includes everything from fruit to nuts to veggies. With the press of a button, you can get all that done quickly and efficiently. So if you are never quite sure how to puree food, this is the product for you. The components of the food maker that are most likely to get dirty are dishwasher safe, which means you don’t have to spend an age doing the dishes later. You can make large batches of the same recipe in one go and refrigerate or store it for later use. When you need it again, you can just make use of the reheat and defrost functions. Tritan material is used in the construction of this device which is 100% baby-safe. It also contains no BPA, Lead, Phthalate or any other components that can cause any kind of harm to the little one. The design has an impact-resistant quality which promises longevity and top quality for years to come. The product comes with a recipe book but in this digital age, that is not enough – you also get e-recipes that are updated on a regular basis, as well as instructional videos for your ease. Its compact design and light weight ensure that you can store it with ease. Multiple functions for your convenience. Compact design ensures easy use and storage. Quiet operation so as to not disturb the baby or you. You can only conduct one operation at one time. It sometimes doesn’t puree the food as well as you may want. The water tank sometimes sees rusting and mould. The multiple functions, quiet operation, and compact size, and all that at a great price ensure that you will be happy with this product. However, do make sure you can come up with a way to keep the water reservoir clean. All in all, this is the best mini food processor by consumer reports. Puree and steam your raw ingredients to create healthy new dishes with ease every time. The added option of a bottle warmer adds further convenience to the equation as it warms the milk to the exact temperature you require without any back and forth action. Being able to work with a four-cup bowl ensures that you can cook in bulk and store the extra food for later. This ensures that you don’t have to get the machine out before every meal time. The steam blade ensures that the steam distribution in the cooking area remains even for consistent cooking throughout. The bowl features a top-notch seal that prevents steam from getting out or the contents from leaving the bowl while it is operational. A patent-pending blade-lock system ensures that the blade stays in place when you are done preparing the meal and are pouring it out of the bowl. The dial control is very easy to use and features an LED indicator light for your convenience. The powerful motor makes sure that you are entirely satisfied with the end result of your cooking endeavour. The Cuisinart Baby recipe booklet that comes with the product allows you to bring diversity to the menu and make new dishes for your child every single time so that they do not get bored and run away from meal time. Also included in the package are a spatula, a bottle adapter ring, and an integrated measuring cup which make the cooking process that bit more convenient. All components of the kid food maker that actually come in contact with the food are free from BPA and all other kinds of harmful substances that can be dangerous for your child. Cook in bulk with a bowl that has a four-cup capacity. Easy-to-operate dial control for your ease. BPA-free, hence safe for your child. Allows you to cook in bulk in a single go (up to four cups of food). The steamer sometimes starts to act up after multiple uses. It tends to leak water. The container tends to get discoloured quickly. While the food maker does allow you to cook in bulk and operate it easily, the food maker has been known to give some parents trouble with functionality and cleanliness. For others, though, it has worked like a charm. So if you think you can keep it clean and use it properly, this product is great for you. This multi-purpose machine lets you do it all. So now you can steam, chop, shred, slice and puree – all five functions aim to make your life a little easier. It sports a double blade for pureeing and chopping and a reversible disc for slicing and shredding. The three-cup steam basket also ensures that you experience utmost convenience during your cooking endeavours for your baby. Its easy-to-use functionality and versatility make sure that you do not have to use your brains and indulge in some kind of scientific thinking just to make your baby’s meal. One of the things that set this food machine apart is that it comes with two stackable caddies and 10 3oz. food containers. This allows you to make your baby’s meals in bulk, all in one go, store separate portions in these containers and refrigerate or freeze them based on your own needs. When you need to take the food out again, you can just reheat a single portion. The food maker comes with a baby feeding guide that also has recipes so that you can try new things on a regular basis, ensuring that your baby doesn’t get bored. The machine is easy to clean up because all the parts that get dirty during the cooking process can be tossed in the dishwasher and cleaned with ease. The parts of the machine that come in contact with the food are BPA-free. They are also free from any other harmful chemicals that be dangerous for your child. It comes with two stackable caddies and 10 separate containers for easy storage of separate portions. This set is pretty much the best baby food maker and storage facilitator in one. Free from toxic materials that are harmful for your baby. Potential issues with the blade (it scratches the inside of the bowl). Many customers complain of a burning smell when running this machine, which could be due to a faulty motor. The number of functions that this machine offers and the overall ease-of-use makes it stand out, especially at the price for which it is available. However, there are some doubts as to the durability of the machine and some design elements also seem to be a little problematic. It works great for some people while others face some issues with the blade and a burning smell that puts them off. The machine offers a two-in-one approach where you can steam your ingredients and then blend them into a puree by flipping the jar over without having to change jars. It is one of the best baby food puree machines currently available. The compact size of the product makes it easy to store. On top of that, it doesn’t take up a lot of space on the counter, something that is especially helpful for you if you have a small kitchen. The jar has a capacity of 800 ml for solids and 450 ml for liquids. This ensures that you can cook two to three cups of food at one time so that you can use it store it for later use. 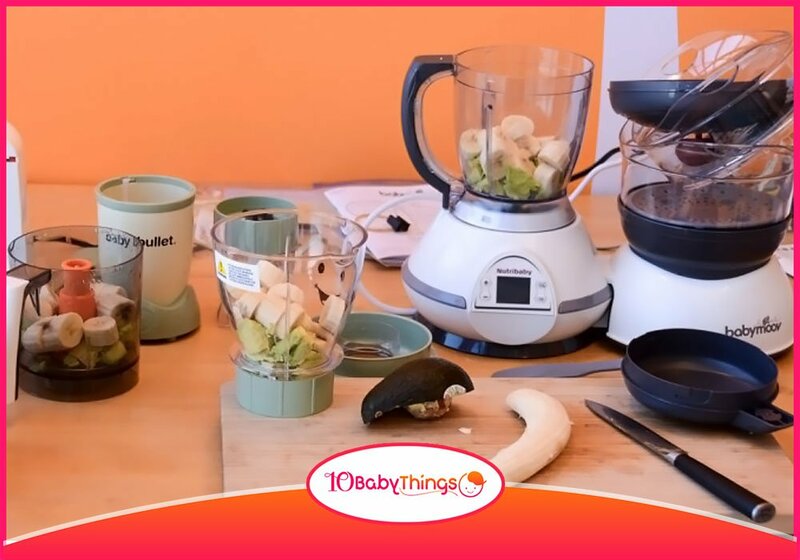 The product comes with a steamer/blender, a spatula, and a measuring cup, making sure that you are fully equipped to create new recipes and make all your baby’s meals with ease. A recipe booklet, which is included in the package, teaches you about cooking for your baby and makes you see it in a new light. With the ability to choose the thickness and texture of the blend when you are making a puree, you can make sure that you cater to the exact needs of your child when preparing food for them. The product is free from BPA, which means that no material that may be toxic or dangerous for your baby in some other way is coming in contact with their food. The steamer and puree blender boast an efficient steam cycle ensuring that the food is cooked optimally while also making sure to lock in the nutrients and cooking liquids. There are only a few parts that you need to clean once you are done cooking, making sure that you do not have to waste any time. The steamer has an easy water filling option which, once again, puts your convenience above all else. The machine features a flip over jar – this allows you to steam the ingredients and then just flip the jar over and attach it to blend. A safety lock system for lid & bowl detection ensures that there are no accidents while you are cooking. One of the most worrying things is to keep an eye on the food while it is being cooked. With this product, however, you don’t have to do that – a beep alert will let you know when it is done so that you can do other things in the meantime. This is a name you can trust in electronics. Easy-to-use machinery and simple operation. Steam and blend in the same jar – just flip it over. Compact design so that you can work around it conveniently and store it with ease. Fewer functions than other variants of the machine. Although this food maker only offers two basic functions, namely steam and blend, it lives up to its name and provides a top-notch performance in the kitchen. With a simple operation and easy-to-use functionality, you get a great product. If you can afford it, you should definitely go for it – it is one of the best baby food makers of 2019. With a two-in-one functionality, you can steam and blend your child ’s food so that they can be well-fed and happy. What’s more, is that if you need to steam a certain item and then blend it – you do not need to change bowls. The same bowl can take care of everything for you. What sets this food maker apart is that the bowl is made of glass, unlike most other variants where the bowl is made from plastic. This means that you do not have to worry at all about any kind of harmful chemicals or material coming in touch with your child’s food. The bowl has a capacity of four cups, which means you can create many portions of the same recipe in one go and refrigerate or freeze it for later use. This saves you the hassle of having to cook from scratch every time. What’s more is that the bowl is dishwasher safe, which means you do not have to spend that extra time cleaning up – you can simply let the dishwasher do its job. The blade can also be put in the dishwasher. A quick operation ensures that you do not have to spend all day cooking – you can be done with the meal in as little as 10 minutes. The machine comes with a spatula, as well as a recipe booklet so you can bring out the inner chef and create true masterpieces for your child. The entire setup is very easy to clean. You can remove the water tank for cleaning purposes – it is as easy to clean as it is to fill. On top of that, the steam tank can also be opened completely for you to wipe every nook and cranny clean. The control panel requires no expertise to run. You simply have to select one of the three options (steam and blend; only steam; only blend) and press the start button – the machine will do the rest for you. A glass bowl, as opposed to a plastic one, is what sets this food maker apart. Easy-to-use control panel – two-touch operation. The components that come into contact with the food are dishwasher safe. Can be considered expensive for two functions. Customers sometimes complain of a burnt smell and even a metallic taste. Other complaints include the fact that it broke for many people after a couple of uses. While some parents have complained of issues with this product by claiming that it broke for them after a couple of uses, a lot of others say they cannot do without it anymore. Although it may seem a little pricey for just two functions, it is recommended because it has a glass bowl and because the different components of the machine are easy to clean. Steaming: 3 baskets with capacities of 150ml, 350ml & 750ml are available for you to steam different food items at the same time. Blending: Easily puree fresh fruits, veggies, and meat. Sterilising: Sterilise your baby bottles, pacifiers, baby teething toys, and so on. Reheating: Reheat baby food to the right temperature with ease whenever you need to. Defrost: Defrost baby food that you stored in the freezer quickly. An LCD display and digital timer allow you to set the time and track the progress of the cooking process with ease. The default time for steaming, sterilising, and warming is 20 minutes, 6 minutes, and 3 minutes respectively. However, you can increase it up to 30 minutes. The product is free from BPA, Lead, Phthalate or and any other kind of harmful substances so that your baby remains healthy and happy. A Tritan blending jar that has a four-cup capacity ensures that you can make large batches of food at the same time and store them for later use. The baskets, splash shield, jar lid, heat insulation cover, and detachable blade can all be put into the dishwasher once you are done cooking. This ensures that you do not have to spend precious time cleaning afterwards. A transparent water monitoring window that looks into the water reservoir can be used to check the water levels without having to actually open up the tank. It is a small machine that does not take up too much space, not on the counter and not in your cupboard. It is also quite light and easy to move around. Five operations for all-around functionality. The product is free from BPA and all other kinds of dangerous substances. HIGHLY affordable – the most inexpensive food processor in this list yet. Small footprint and light in weight. Some users experienced issues with the blade. There may be better machines out there but you have to admit, you have to pay quite a bit more for them. If you are looking a baby food maker on a budget, one that provides you with multiple functions, as well as ease of use and cleaning, this is the one for you. It will not disappoint – it is the best baby food maker and steamer you can get without putting a hole in your pocket! This 20-piece set may just be the solution to all your baby food cooking needs. It includes the batch bowl & stay-fresh resealable lid, power base, 12 date-dial storage cups, baby blend blade, baby milling blade, stay-fresh seal lid, 2 tip proof trays, 3 easy pop batch trays, short cup, spatula, turbo steamer, pocket nutritionist, user manual and cookbook, and healthy baby nutrition guide. With so many things on offer, the opportunities are endless. With multiple functions, including chop, mix, blend, whip, and grind, you can sit back and relax and let the machine do the work for you. The set has you ready for the entire process of preparing food for your child to storing it with utmost ease. With multiple containers and trays in which you can store the food for later use, you will never run out. With an eight-cup capacity, you can make food for the entire week in one go so you don’t have to whip the machine out before every meal time! Made from BPA-free material that does not contain any phthalates or toxic elements, the food maker is safe for your baby and doesn’t pose any kind of threat to them. The food that you create using this set of accessories is packed with vitamins and nutrients as it doesn’t lose them during the cooking process. The cooking time is extremely small with food maker, something that ensures you don’t have to be stuck in the kitchen all day long. Easy to wash and rinse, it doesn’t take much time to clean other, promising all-around convenience. When you buy this system, you’re making a long-term investment as you can make purees for your very young child, interesting textures for the next stage of their life, and full-fledged meals for when they can chew properly. The storage cups are perfect size and also have date dials which help you keep track of when you made the content inside and when you can use it till. This is a great convenience for busy parents. Make large batches of food (up to eight cups) in one go. The product comes with a large range of storage containers and options. Free from all types of toxic material. Many parents complain of a foul, almost-burning smell. While some parents are known to have had a bad experience with this product, it is an overall comprehensive solution to all your cooking needs when it comes to your baby. With options to make the food, as well as to store it, that too at a very reasonable price, it is a great deal. With this food maker, you can carry out many functions using the same machine, ensuring that you don’t have to spend money on separate ones. With the ability to chop, blend, steam and defrost to perfection, there is nothing more than you need. It comes with a measuring cup, cooking basket, mixing cover, spatula, and extra blade seal. The water reservoir has a wide opening with a rotary lid that allows you to pour water in it easily. This makes it quite easy to clean. With this technologically advanced machine, you can make use of the preset cooking times for different kinds of food items. This will make sure that the food is perfectly cooked every single time, without you having to hover over it throughout the process. The product features a premium precision prep blade which ensures that you get the perfect blend each time – so no more lumps that your baby will feel the need to spit out. An easy-to-operate control button makes sure that you are in charge. The steaming basket, mixing cover, mixing jug, jug lid, water reservoir lid, and detachable blade can all be washed in the dishwasher once you are done cooking. This means you don’t have to spend all that extra time cooking. Made of food-grade materials, this machine keeps your baby’s health and safety in mind by ensuring that all of its components are free from BPA, Lead, PVC, and Phthalate. This means your baby remains protected from all kinds of toxic substances and their harmful effects. The machine features an auto-shut off option that makes sure it turns off before the water in the reservoir dries up. This prevents the electrical components of the machine from getting damaged. The 360° uniform and rapid heating ensure that the food remains packed with nutrients and your baby remains healthy. Four-in-one functionality has you covered from all angles. A little towards the higher price end. If you ask us what is the best puree machine that also performs other functions well, we will point you towards this option. A great machine that offers some of the best features that are well worth the price, you can’t go wrong with it. These are 10 amazing food makers that are available today. But which one do we think is the best one? Find out! For us, the winner is the QOOC 4-in-1 Baby Food Maker Pro! While we discussed it last, it certainly deserves to be at the top of most lists. Offering four different functions, including the ability to chop, blend, steam, and defrost, it has you covered from all sides. It also sports some other unique, innovative features, including an auto shut-off option, easy handling and cleaning of the water reservoir, and preset cooking times that ensure the perfect meal every time. Free from BPA and all other toxic materials, it is well worth its price – certainly one of the best baby food makers currently in the market.